When Bruce Donovan arrived at NECO in 2015 as General Manager, he recognized the organization's enormous potential. The company had world-class drivers transporting gasoline and diesel to retailers throughout the Northeastern United States and Canada. The organization focused on safety and was renowned for its exceptional customer satisfaction. NECO had to move to electronic HOS logging soon due to changing ELD regulations. Donovan saw this as an opportunity to significantly improve the fleet's efficiency. The team was manually recording driver hours of service, key performance indicators, and maintenance activities. Donovan, with an education in Accounting and 30 years of operations and fleet management expertise, saw the switch to electronic logging as the perfect time to shift NECO to real-time analytics, introduce digital recordkeeping, and focus operations on data-driven decision making. Donovan’s first goal was to alleviate NECO’s drivers of the burden of paper logs, and to ensure compliance with the upcoming ELD Mandate rules on Hours of Service (HOS). As a second priority, he wanted to make the fleet's performance data more accessible to enable faster decision-making and end paper-based recordkeeping. Donovan tried out Samsara, installing Samsara VG33 vehicle gateways in the trucks and adding the Samsara Driver App to driver iPads. He instantly saw the live location of every truck in the Samsara Dashboard and was hooked. Now the NECO team has vehicle gateways installed on all their trucks, with drivers logging their hours of service with the Samsara Driver App. When Donovan arrives in the morning, he first opens Samsara’s Fleet Summary Report. He sees fleet activity, including miles and hours driven, next to safety information for each driver, and fuel use for every vehicle. This is where Donovan first identifies opportunities to improve the fleet’s efficiency and safety. He then drills into the relevant Samsara reports to explore details. Since NECO transports flammable materials, their NECO drivers operate with the highest safety standards and management is constantly vigilant of safety risks. In the Safety Report, Donovan looks at each driver’s safety incidents — if they’ve been speeding, braking too quickly, or taking turns too fast. He uses this to identify frequent issues and address them with safety training sessions. He also runs a safety bonus program, where drivers are rewarded for their safe driving. Every week, Donovan shares the Samsara Safety Report to inform management of the team’s improvements. In addition to encouraging safe driving behavior, Donovan ensures drivers stay alert and in compliance with FMSCA’s Hours of Service rules. 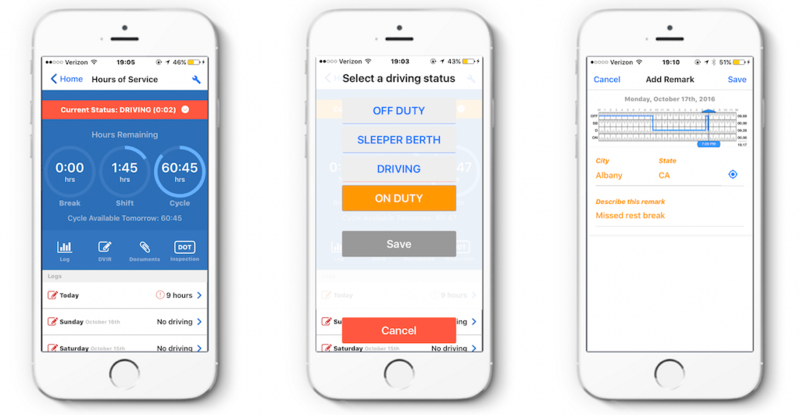 Instead of paper reporting where the fleet manager asked drivers how many hours they had remaining before their break or shift-end, the drivers now use the Samsara’s Driver App to track their hours. Samsara combines inputs from the Driver App with data from the vehicle. When the truck starts moving the driver’s status changes automatically. When drivers enter the vehicle they only need to set their status to “On Duty” in the app. When their truck starts moving, the app automatically sets their status to “Driving”, logging their hours and setting back to “On Duty” when their truck stops moving. The drivers only need to use the Driver App when they start and end their shifts. They can focus on driving without worrying about their hours. The Driver App shows the hours remaining for their shift in large, clear numbers, so they driver can easily see if they’re nearing a stopping point and plan accordingly. Back at the NECO office, The Operations Team can see real-time hours and statuses of all drivers in the Samsara Dashboard. The team knows that drivers have all this information and will make the right decisions, but if a driver does violate HOS rules, they see the violation in the Samsara Dashboard. The team also uses the HOS reporting to audit paychecks. They review self-reported timecards and confirm that they line up with the reports in Samsara's Driver HOS Report. Another paperwork-intensive process is tracking IFTA (International Fuel Tax Association) mileage for tax purposes. Before Samsara, drivers were required to record their mileage on different highways. The most complicated recording is New York State thruway and non-thruway mileage, since thruway mileage for NECO’s heavy vehicles is tax-refundable. Samsara now automatically tracks IFTA mileage for every driver, which is laid out in an easy-to-read chart that can be exported or periodically emailed to administrators. On top of maintaining safe and compliant operations, Donovan and his team are constantly working to run NECO more efficiently and economically. He uses Samsara’s Utilization Report to track the real-time use of the fleet, and recognizing vehicles that are being over- or under-utilized. He regularly provides this information to NECO’s executives so they can plan for vehicle replacement and purchasing. They can also log in and see live information at any time, raising the visibility of the team’s hard work and informing real-time decisions like never before. If a truck has an issue, Donovan knows instantly. He’s set alerts to know immediately when a truck’s check engine light activates and sees the details of the diagnostic code in the Samsara dashboard. He can let a driver know if the truck is still OK to drive, and ask his maintenance provider to procure the necessary parts before the truck is brought in for service.